Register to join thousands in the unique photo competition that challenges participants to create photographic masterpieces in line with assigned themes - under time pressure. Stretch your creativity and endurance in this full-day event, and two winners from each country stand to win an unforgettable 8-day photo clinic to Hungary hosted by professional photographer Triston Yeo. 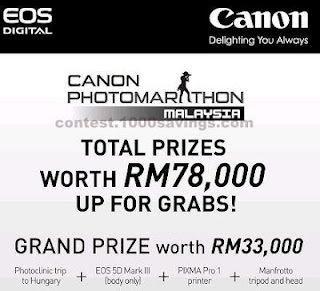 Visit CANON Photomarathon Malaysia Contest for more details. Want to go on a dream road trip with Hanis Zalikha and Scha Alyahya? Play this game now.